Lawyers’ Professional Indemnity Company (LAWPRO) was created to insure lawyers against legal malpractice claims. Most claims are brought by a lawyer’s own client and include an allegation that the lawyer made a mistake or did not meet the standard of care expected of him or her when delivering legal services. No lawyer is immune to a claim; in fact, our records suggest that four out of every five lawyers will be the subject of a claim at one point in their career. Malpractice claims can be stressful, can hurt your reputation, and can be costly (even if the only financial consequence to the lawyer is an increase in insurance premiums). Understanding the most common causes of claims so that you can build risk management skills early in your career is your best line of defence. What kinds of mistakes lead to claims? 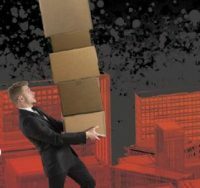 Students in the midst of law school, with its mountain of reading on cases and substantive law, might be surprised to learn that “errors of law” are not the biggest pitfall to watch out for in the world of private practice. In fact, in the last ten years, only about 13 per cent of LAWPRO malpractice claims were caused by lawyers getting the law wrong (except in very complex areas like family or tax law). So, if knowing the law isn’t the problem, what is the danger that new lawyers should be on the lookout for? In a nutshell, you could call it “human error”: breakdowns in communication, poor calendaring and procrastination, and not digging deeply enough into a client’s matter. These types of errors make up almost 67 per cent of the claims LAWPRO sees. In almost every area of practice, the number one cause of claims to LAWPRO is a breakdown in lawyer-client communication. This ought to be the easiest type of error to guard against, but it is also the most common. Often these claims arise because the lawyer and client disagree on what was said or done – or not said or done – sometimes because communications are rushed. This is partly the result of lawyers being busier than ever, and partly due to clients who expect faster replies and more ‘round the clock’ responses from their lawyer. However, there is much that can be done at every stage of the matter to prevent these types of claims. Right from the outset, a well-drafted retainer letter can set the client’s expectations of how the matter will proceed and what the lawyer will (and won’t) do for them. As the matter progresses, it is important to document conversations with the client, your advice, and the course of action the client wishes to pursue. This documentation can be a lifesaver in the event of a malpractice claim. Clients may later say they asked the lawyer to do X and it wasn’t done; or the lawyer may have done Y and the client claims he didn’t authorize this course of action. If there is no documentation of lawyer/client conversations, the claim then turns on credibility, and LAWPRO’s experience has been that courts are more likely to believe the client’s more specific recollections over the lawyer’s typically vague or non-existent memory. It’s an unfortunate fact that while email and other electronic media provide more ways than ever for a lawyer to interact with clients, all these lines of communication seem to result in even more misunderstandings. Clients or lawyers read things into emails that aren’t there, miss the meaning of what was said, or read between the lines and make assumptions. Face-to-face communication is the best way to ensure miscommunications don’t happen. If meeting in person isn’t possible, at least pick up the phone to avoid misunderstandings when important matters need to be discussed. Clients whose expectations have been adequately managed are less likely to turn on their lawyers (rightly or wrongly) than those who are taken by surprise by the result of their case or legal fees. Visit practicepro.ca for our resources on managing lawyer/client relationships. This is a type of error closely related to poor communication and is best described as lawyers not taking the time to uncover all the facts or develop sufficient understanding of a client’s matter. It can be considered a symptom of “smartphone legal advice”: quick questions and quick answers by lawyers and clients who are both in a rush. These claims go to the very core of what lawyers are supposed to do for their clients – give legal advice based on the client’s specific situation – and involve the lawyer not taking extra time or thought to dig deeper and ask appropriate questions about the matter. These claims can arise in any area of law. We see them most commonly in busy real estate practices, where rushed lawyers miss deficiencies in a condo status certificate, misread a survey, or don’t find out what long-term plans a client may have for a property (so that they can ensure those plans are viable). In litigation it could mean not making a reasonable effort to identify all the parties to an action within the limitation period. In wills and estates law it could mean not inquiring into the capacity of an elderly client or failing to ask about the existence of previous wills. The best way to avoid these claims is to simply slow down. Take the time to read between the lines so you can identify all appropriate issues and concerns. Ask yourself: What does the client really want? Does everything add up? Are there any issues or concerns that should be highlighted for the client? If something seems missing, dig deeper. It seems to be human nature to put off tasks until the deadline is looming (as any student pulling an all-nighter will attest). It’s no different for lawyers, which makes missed deadlines a major source of LAWPRO claims. This is most common in plaintiff litigation, which has strict limitation periods and document filing deadlines to manage. While every lawyer seems to have a dusty file or two in their office that they never quite get around to, time management claims are not always the result of simple procrastination. In some cases the lawyer fails to ascertain the limitation period on a matter, or even if they do know, fails to properly calendar the limitation period or act when it comes up. There are a number of things you can do to avoid missing a crucial deadline. Use practice management software with tickler systems to alert you to approaching deadlines and be aware of the danger of the registrar dismissing an action for delay under Rule 48 of the Rules of Civil Procedure (see our Rule 48 Transition Toolkit at practicepro.ca/rule48 for help). Finally, building in a one- or two-day cushion on deadlines and reminders can help prevent this type of error when there are unexpected problems that stop you from meeting a deadline for a filing (e.g. ice storm or taxi in an accident on the way to courthouse on last day to file). These are very general descriptions of the common causes of LAWPRO claims. If you want to learn more about malpractice claims in particular areas of law, you’ll find a wealth of articles at practicepro.ca. 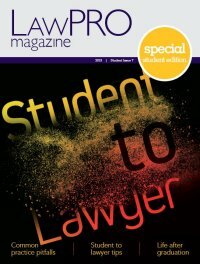 There are detailed examinations of claims causes in several areas of law, as well as articles featuring advice from LAWPRO’s claims counsel on the common mistakes they see lawyers making and how to avoid them. Tim Lemieux is Claims Prevention & Stakeholder Relations Co-ordinator at LAWPRO.